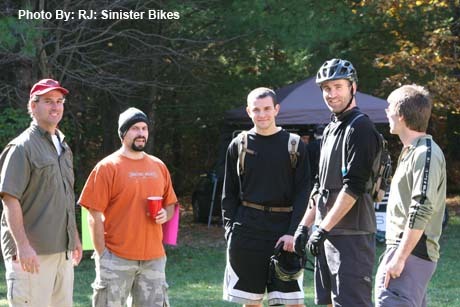 We were thrilled to be a part of the 10th Annual Wicked Ride of the East hosted by NSNEMBA on October 25th. Over 500 riders from all over New England arrived to show support for this organization and some of the trails we all love. It could have not been a more perfect October day with the sun shining and temps in the mid 60s. The Dieselbikes’ movie tent showcased both local amateur and professional mountain bike videos all day for event attendees to sit back and relax at between rides & other activities. Other sponsors included Cycle Loft, providing trail-side mechanic/quick fix repair work, Highland Mountain Bike Park, giving rider skill clinics, and our friends from Sinister Bikes who were making noise and causing trouble (in a good way) with their arsenal of demo bikes. The Dieselbikes crew was out in force hitting the trails at Harold Parker logging in 20+ miles with two separate rides. After the crowds died down, we aimed our bikes at the stone walls, picnic table and wooden teeter-totter, playing around on our bikes and showing off for the camera. The event was a great success and we were happy to be a part of it. We plan on working with the NSNEMBA group for next year’s event and hope to help continue this fun fall tradition! Check out the NEMBA website for more post event information including pictures by clicking on this link!